From 00:00 UTC on 5th July until 23:59 UTC on 10th July, pick up skilling outfit pieces on Treasure Hunter, then combine them to make Elite Skilling Outfits. For the first five days, a different outfit type will be available, including a couple of new entries for the Bonanza – the Camouflage Outfit for Thieving and the Gorajan Outfit for Dungeoneering. Then, on the sixth day, you’ll have a chance to get any of the five outfit types. Note - If you complete all the outfits then you will be rewarded instead with either a large lamp or large star for the skill represented by that day's outfit. On the final day, the prize will be a large XP star or lamp for any of the skills counted for across the promo. How do Elite Skilling Outfits work? Each standard skill outfit comes in 3 cosmetically different varieties (4 for the Dungeoneering outfit), each of which has five pieces. When worn, these grant XP and skill-related bonuses for that skill, some of which increase in potency the more pieces you wear, and some of which are only granted when wearing a full set. Combine all three varieties of an outfit piece to create an Elite Skilling Outfit piece. Please note that Elite Skilling Outfits cannot be won directly on Treasure Hunter, and can only be created from pieces of the lower-tier outfits for their skill. 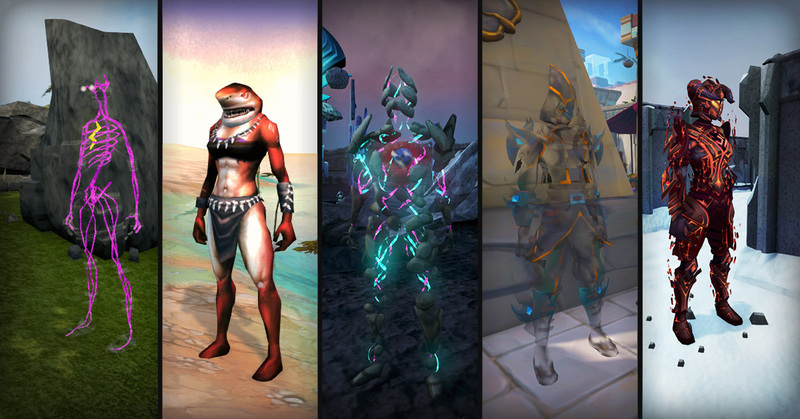 When all five pieces of an Elite Skilling Outfit have been created and are worn together, they confer a great number of benefits for that skill. This is the perfect opportunity to collect the pieces you need for that amazing skilling outfit - or outfits! Have fun, and we’ll see you in game. Cool, but when's the next new outfit? Why would anyone get the following Three outfit on TH, when they can be found in game? please be smart about this community and just get the fragments and combine them! Yes I know not everyone has the invention level to make the pieces, but those who do... just get it in game. Also, to make it on topic: Adding these three to TH is just silly. I've been wondering about the Nature sentinel outfit when will it be available again? I thought it was a Elite outfit aswell. I must wait until July 9th too. As Blackwing asked: When are we getting a new elite skilling outfit?